Vanessa Rousso, aka "Lady Maverick"
Vanessa Rousso is in our opinion (and I hear that we are not alone), the hottest female poker pro on earth. When we say poker pro here, we are not talking about any poker beauty playing some poker tournaments and letting the railbirds lose their poker mind. After all, Pamela Anderson and Paris Hilton also play poker. No, we mean that Vanessa Rousso is a female poker star who is feared on the international poker circuit and who makes loads of money, but who is also by far the sexiest female poker pro to do so. Vanessa was born in White Plains, New York in 1983. Her father is French, but she was raised in Paris, France until 1993. Vanessa retains dual citizenship and can speak French and English fluently. When her family moved back to America, Vanessa first spent some time in New York, and then attended high school in Wellington, Florida where she graduated the valedictorian out of a class of about 900 students. Vanessa Rousso later went on to study at Duke University, where she graduated with honors on full scholarship. She finally went to law school in Miami, majoring in securities litigation. Until she discovered online poker. While at Duke, Vanessa Rousso became more and more interested in Game Theory, which studies how to make optimal decisions in complex math-based decision making competitive games. Coupled with a lifelong love of games, this was a perfect preparation for her to become one of the best poker players in the World. 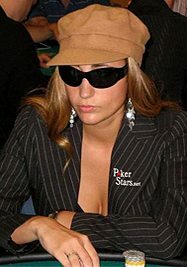 Nowadays you can often find her playing at PokerStars, but she started playing poker at live casinos in Indian Reserves. Vanessa Rousso is a Team PokerStars member, meaning that Vanessa is a poker pro representing pokerstars. So wherever you see her, chances are there will see a pokerstars logo. If you do not want to see the logo, our best recommendation is to look for Vanessa at the beach, but she might still wear a pokerstars hat. If you play at pokerstars, you can get a chance to play heads-up against Vanessa Rousso, as some small field VIP special events have as first prize such a heads-up match with our favorite poker hottie. As we said Vanessa is not just hot, she wins a lot of money, both at online and live poker. Vanessa has had 11 money finishes at the WSOP. She is quite a versatile poker player as she went in the money in No-Limit Holdem, Pot Limit Holdem, HORSE and No-Limit 2-7 Draw Lowball. At 23 years old, she was the youngest female player to make it to the final table of a WSOP circuit event, finishing 5th at the $1,500 No-Limit Holdem event at Harrah's Atlantic City in 2006. Vanessa also had 5 money finishes at WPT events and one at the EPT. She finished second to Huck Seed in the 2009 National Heads-Up Poker Championship tournament. She finished 7th of the 2009 WPT Season 7 Southern Poker Championship. Vanessa's biggest prize came from her victory at the €25,000 EPT High Roller Championship in 2009, cashing $749k. Another of Vanessa's huge wins was online when she finished second at the main event of the 2007 WCOOP (World Championship of Online Poker held at PokerStars) Main event, cashing $700k. Vanessa's total tournament winnings are in excess of $2.486 million. At 26 years old, Vanessa is among the top five women for all-time money winnings. But that is not all. Vanessa Rousso also makes some extra money by endorsing companies such as godaddy.com. And she appeared in the swimsuit edition of Sports Illustrated. There is certainly more to come from "Lady Maverick".